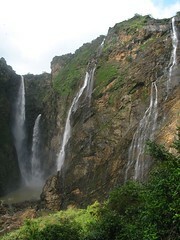 While reading Arun’s post about Jog Falls being featured in the new movie Mungaru Male, I was reminded of my own visit to Jog Falls. More specifically, the camera angle that he mentions was something that I had experimented. Quite a dangerous thing to do, but managed to do it as safe as I could be. Take a look. Note: click to see a bigger picture at the Flickr site. This picture is from the other side of the Tourist Bungalow managed by the KPTCL. 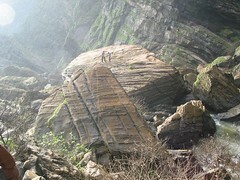 Here, there is a outcrop of a rock from where you have a straight drop into the gorge below. If you dare, you can lie flat over the rock and inch closer to the precipice. And then look over. To your left, Raja falls down majestically. And as you crane your neck to look straight, you would see the small rocky channel from where Roarer gushes down and then flows into the gorge with a deafening sound. And if you can risk it, take a picture… which looks like the one above. Located in Shimoga district, very close to a village called Gerusoppa, it is ranked 314 among the world’s tallest waterfalls. It is among the tallest ones in Asia too. 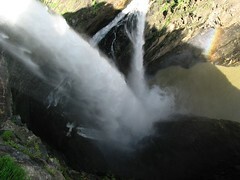 Here, the Sharavati River falls down a vertical 253m (829ft) in a thundering cascade. 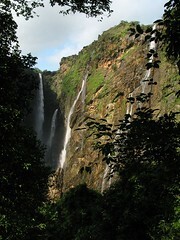 The waterfalls itself is composed of 4 parts – the majestic Raja, furious Roarer, the fast Rocket and beautiful Rani. Raja is the most voluminous of the 4 and falls vertically down, therefore the tallest of all. 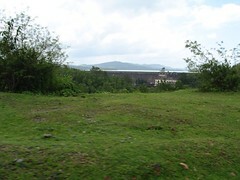 The waters are released from the Linganamakki Dam. In Monsoons, when it rains copiously in these areas, the dam gates are opened on full flow. I have never seen the falls in full spate, but wish to. It seems, this is the sight that greets you. Awesome! There is no single best place to view the falls. Most of the tourists see it from the Tourist Bungalow. And this is the view that they get. If you can, please do travel to the other side to enjoy another perspective of the falls. And if you are an enthusiastic lot, you may trek down to the valley floor. But only when the falls are not in spate. From the valley floor, you get an altogether different perspective of the falls. You feel humbled by the magnitude. These rocks would have been a part of the hill side. Thanks to the waterfall and its erosive activity, these now grace the valley floor. Their sheer magnitude gives us a sense of the power of falling water. And this is the view that we got as we were about to leave for Bangalore. Enjoy the complete picture album on Flickr. 2. 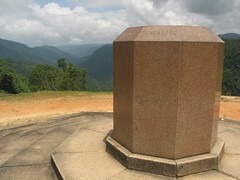 Raja Kal – a stone foundation setup by the Maharaja of Mysore that commemorates his visit to this place to inaugurate the project and also shows general directions to many major towns and cities. 3. A visit to Gokarna and Murudeshwar can be combined with this trip. 1. 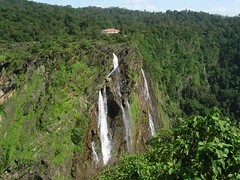 You can take a KSRTC Luxury bus to Jog Falls. 2. 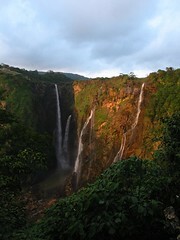 You can drive down to Jog Falls from Bangalore via Tumkur-Tiptur-Shimoga-Sagara. A distance of about 380 kms. 3. You can go to Goa (air/train) and drive southwards. 4. 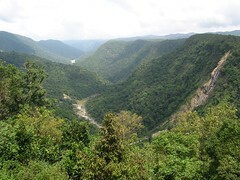 If you know someone in KPTCL, you can take an excursion into protected areas which are not available to public. If you do manage to get this done, you will waterfalls taller than Jog falls. And far more beautiful too! Probably not publicised to maintain security of the power station installations in the valley. 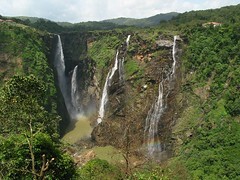 Refer Karnataka Tourism Page for Jog Falls. They have listed some places where you can stay. And make sure you visit the falls atleast once. I bet you will never forget the beauty! with the advent of the internet. I am learning soo much about our own towns and cities. Keep it coming. Thank you.